For many people that means by February, it's time to go on a vacation somewhere warm and sunny. But while you're out soaking up all the vitamin D you can manage, it's important to be wary of digestive issues which can arise from unknown food and water conditions while you travel. 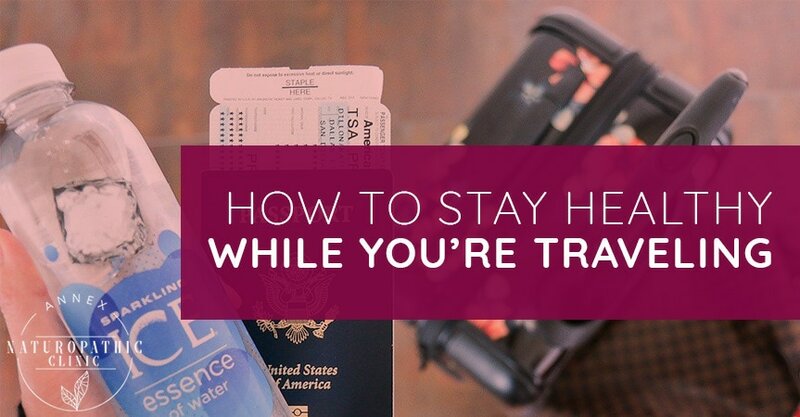 Let's look at some key tips on how to stay healthy when travelling, so you can see the world - and not just the inside of your hotel room's washroom. When travelling in developing countries, it's important to be careful of what you eat and drink. Hepatitis A is a liver disease which is transmitted through contaminated food and water. Fruits and vegetables should be cooked before you eat them, and bottled water is preferred over tap water - and double check that the bottles are sealed. Additionally, skip the ice cubes in your drink unless you're sure they have been made from purified water. From the dry climate in the airplane, to the fun-in-the-sun time you've planned when you get to your destination, it can be easy to become dehydrated when travelling. You want to drink enough that you're urinating the normal amount you would be back home, and if your urine is darker than usual it's a sign you need more water. Alcohol and coffee don't count - they can dehydrate you, so if you are partaking in these beverages, be sure to drink more water to offset it. When you're keeping step 1 in mind, it can sometimes be hard to be sure you're getting enough water, so be sure you've planned out where and when you can get enough water to keep you going. With late nights partying, and early mornings to catch the sunrise, it can be very easy to become sleep deprived when on vacation. Not only will sleep deprivation make your vacation less enjoyable, it also means you will become more susceptible to getting sick if exposed to a virus. Tricks such as keeping your hotel room cool, avoiding caffeine in the afternoon, and putting away your screens an hour before bed can help ensure you are getting enough sleep. Melatonin helps your body to regulate and rebalance your circadian rhythm. If you are travelling in a different time-zone from the one in which you live, using a supplement such as melatonin can help you to fall asleep and adjust to a new schedule quicker, especially if “bedtime” in the new time-zone is widely different than what your body is used to. Probiotics - in other words the “good bacteria” - which live in your gut are important for your overall health. Keeping your gut healthy in unfamiliar places is important, as it will help counter any “surprises” that may be waiting in the food. Even if you're being careful about which foods you consume when travelling, because food standards differ widely across the world, you never quite know what you're getting. Ask a naturopathic doctor which probiotics can be effective and safe for you to take while on vacation to prevent intestinal ailments such as traveller's diarrhea. Whether it's medication you need to take all the time, or any of the supplements listed here, the key to these substances working is consistency. Setting a reminder to take your pills and supplements is easy to do if you have a smartphone, and is vital to making sure you don't forget them in all the excitement of travel. If you have medication such as a birth control pill that needs to be taken at the same time every day, try to continue taking them at the same time as you would when at home, even when in different time-zones. From protecting yourself from sunburn in climates where the UV rays are stronger than at home, to avoiding more serious issues such as heat exhaustion and heat stroke, sun protection when travelling is important. A sun hat and keeping covered is the best way to stay protected from the sun's rays. If you must expose your skin in order to get a nice tan, if you're too hot to stay covered, or when swimming, choose a sunscreen with a minimum of SPF 30, and be sure to reapply often. Each location you visit will have it's own set of local risks. In some places you may want to bring extra bug spray and perhaps even mosquito netting if you are camping. For others, there may be local outbreaks of disease to be conscious of and take precautions to avoid. Wherever you are travelling, be sure to research the specific area(s) you are visiting to know exactly what the risks are, and how to take the appropriate precautions. No one wants to get sick on vacation. And a great preventative measure is to ensure you are in the best possible health before you set foot on an airplane. Annex Naturopathic can help with that - contact us now to find out how you can maintain your health during your travels. If you're curious to learn more about this subject or would like to consult with one of our NDs feel free to book a visit or contact us. Searching for a naturopathic clinic in Toronto? Annex Naturopathic Clinic is a clinic in downtown Toronto that offers integrative healthcare solutions. Drs. Marnie Luck and Tanya Lee, ND, offer treatments such as diet, exercise, and lifestyle counselling, nutritional supplementation, vitamin injection therapy, bioidentical hormone replacement therapy, herbal medicine, acupuncture, and musculoskeletal manipulation, among others.